My Bionic Grandpa had a birthday last week so we all ended up at Bionic Grandpa and Grammy's house. In case you don't know, Bionic Grandpa and Grammy live in the middle of a forest with a lake in their backyard. Mom made a movie of me doing my absolute FAVORITE activity when we visit Bionic Grandpa and Grammy. Hey there! Look! I have another blog post this week! Old picture, but another post! Hurray! I'd like to report that I got the all clear from my Vet - plus a WHOLE bunch of ear scratches and nose kisses. That's about all the news from me. I think maybe I'll go for a nap. 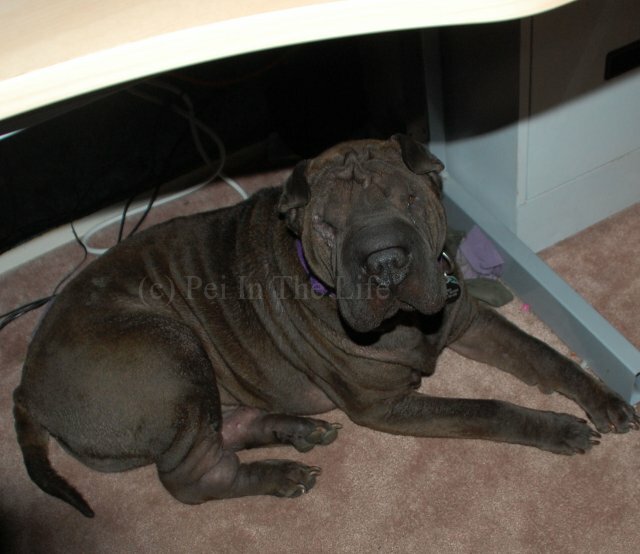 There's a bit of room here under Mom's desk if anyone else needs a nap. So I looked at my blog roll and realized I had missed almost a WEEK of peoples blogs! I am SO sorry! I feel like I've missed so many things! Mom and I are reading everything now to try and catch up. I've been pretty busy, lots of playing needs to be done. Naps to take. I'm still not getting as many adventures as I want, but that darn weather just freezes a pei right through his wrinkles! Mom tried to get both of our faces, but Puppy was too fast and Mom was using her iPod. But you get a pretty good look at me playing with my rope. Puppy was playing tug. He's getting better, but I can still keep the rope away from him. Mom says I have to go back to the Vet tonight and that they're going to try and steal my pee again. Can't say I'm looking forward to that. That's all my news! I'd better get back to catching up on blogs! Well, I've been eating this wet food for a week now. It's ok. Mom is a little worried because I don't gulp it down when she puts my dish in my eating place. I just need to take my time, eventually I eat it. Well, most of it anyway. Mom and Dad got me the good stuff. Apparently it was on sale. I can't say I enjoy getting those big orange pills though. I was hoping Ann T Biotics would be a new Facebook friend. Apparently NOT. The camera hasn't come back out AT ALL. Horribly unfair, I've been sleeping on the new sofa and everything and NOT ONE PICTURE. Mom is such a slacker. Everyone here has a cold, they're all coughing and sneezing. Luckily, Puppy hasn't come up to ME and tried to wipe his nose on me. He'll do that to Mom and Dad, I don't stand still long enough when he's around. That's about all my news. Freezing Rain and really cold temperatures are condemning me to taking much shorter walks than I'd like. Pei-Ess I almost forgot to post a picture! So you get a Puppy Picture of me!